I had no idea that Mark Twain, Toni Morrison, or George Orwell are all pseudonyms! It's been a while friends, a very long while. So, life got crazy busy, but I'm still reading and hope to share some that with you all in the near future. 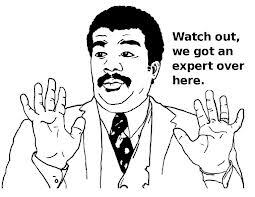 When People Call Books or Authors Pretentious. 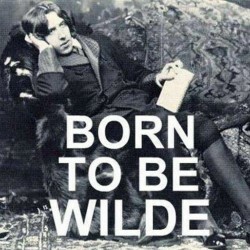 I hate it when people call books or authors pretentious. I'm just going to come out and say it. I hate it. I completely respect it if people find certain books or authors unnecessarily convoluted or even condescending. I may not agree with them, but that's just fine. Some books do seem unnecessarily convoluted. Sometimes authors can come off as condescending. However, that doesn't mean that these books or authors ARE overly convoluted or condescending. As a reader, I think our opinions are incredibly valid and that we can feel or react to novels and authors in any way that we find fit as long as we recognize that our perception of anything is not necessarily the reality of that thing (and, of course, as long as we aren't careless and disrespectful with our views). 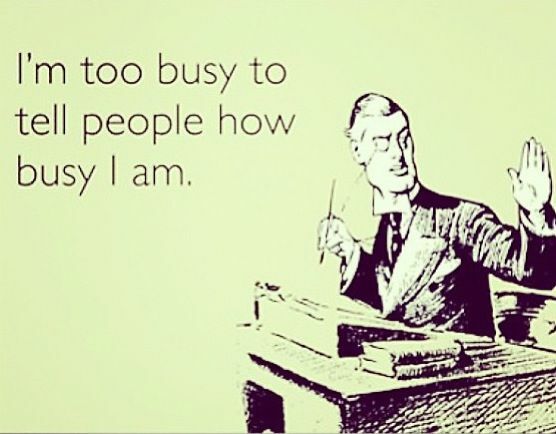 But back to my problem with calling a book (and anything or anyone, really) pretentious. When someone calls something pretentious, they are expressing the opinion that that thing is pretending to be smarter than it actually is, that it is pretending to be more impressive than it actually is. And how the heck does that person know (not just feel, but actually know) that that book/author/thing ISN'T as smart or impressive as it endeavours to be? Just because an individual isn't impressed with a particular book/author does not mean that book is any less intelligent and just because that book/author's form of intelligence doesn't mesh with that reader does not mean that the book/author must be pretending. I also think it is incredibly disrespectful to say that an author is PRETENDING to be smart. There are thousands upon thousands of variations of intelligence and just because some types of intelligence don't ring true for certain readers doesn't mean that they are invalidated and thus pretentious. And I personally don't think that someone can convincingly pretend to be smarter than they actually are--if someone says something is pretending to be smart, they must on some level recognize that some form of intelligence exists in whatever they are criticizing and, in that case, the thing is just smart. No pretending involved. What do you think? Does this piss you off too? Animal Farm & 1984 Review! I never got to read George Orwell in high school and man am I happy that I took the time to read 1984 this May, thus completing my bind-up edition of Animal Farm and 1984. 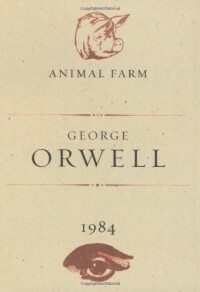 I read Animal Farm about a year ago now, but never got around to reviewing it; so, before I get into 1984, let me share a few of my thoughts on Orwell's allegorical novella. Though simple in its scope, Animal Farm worked really well for me. Like most of the allegories that I've read, Animal Farm was very easy to understand and I can see how some people might find that annoying, but I personally didn't mind at all. In fact, I found the simplicity to be part of this piece's genius. I particularly enjoyed the last line. Perfect. Overall, I'd give Animal Farm four out of five stars, not so much because of any of it's failings, but because I just can't put it on the same level as the novels that I've given five out five stars. Now on to 1984. I really loved certain elements of this novel, particular the political atmosphere and the dystopian setting. When these elements were at the forefront, I sincerely enjoyed reading it. However, when Orwell moved into Winston's romance, I became considerably less engaged. When the politics were the main focus, I didn't mind the fact that character development wasn't a priority, or strength, for Orwell, but this lack of development really stuck out during the romantic story line. I also found myself troubled by Orwell's depictions of women. I would need to analyze these depictions with greater diligence to completely articulate my thoughts, but, as a basic gut reaction, I found myself uneasy with the seeming lack of depth in the main female character, who doesn't have a name for much of the novel, and whose name now escapes me. Though I am troubled by Orwell's female lead, I don't think that this necessarily takes away from the genius of his work; I merely acknowledge that this is a weak aspect of his writing. Overall, I really enjoyed 1984, but really think it could have done without the romance entirely. To my mind, the political atmosphere and world building are the novel's greatest strength. Four out of five stars. Wow. What a great manga! 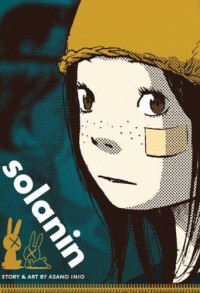 Combining humour, melancholy, apathy, and grief, Asano Inio's Solanin gives a startlingly accurate depiction of what it means to be in your twenties, struggling with the end of college life, working at uninspiring jobs, and tackling the fears associated with following your dreams. I would highly recommend this manga to anyone in their twenties, especially those who are just finishing college and moving into the world of adulthood. I can definitely see myself rereading this one! Let me start by saying that I am a huge Murakami fan. I love his prose, the surreal elements of his plots, and the inexplicably alluring atmosphere imbued in everything that he writes. All this being said, 1Q84 didn't exactly blow me away. Don't get me wrong, I really really enjoyed this novel, but it just isn't at the same level as my favourite Murakami novels: Sputnik Sweetheart and Norwegian Wood. Personally, I find that Murakami's shorter novels pack a more poignant punch for me. Independent of my high Murakami standards, 1Q84 is an incredibly intriguing novel. The characters are engaging, dimensional, and possess the same unnamable quality as all of Murakami's characters. The blending of fiction and reality is well executed, and particularly interesting when compared with Orwell's 1984. Murakami works with a lot of the concepts in 1984, but takes them in a very different direction. 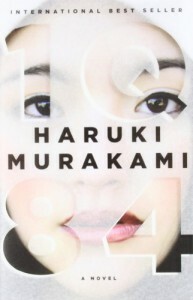 Unlike in Orwell's 1984, I really loved the romance in 1Q84. I found it to be one of the strongest elements of the novel, whereas the romance in 1984 fell incredibly flat for me (but more of that in my 1984 review!). I gave the first two books of 1Q84 four out of five stars and the third instalment four and a half out of five stars. The ending of the novel pushed me into an overall rating of four and a half out of five stars. So, I've been getting back into watching anime this month and man have I been loving it. Best thing about having Netflix? Anime. Without further ado, I've got three new animes that I'd like to discuss today. The first is Sword Art Online, which can be found conveniently on Netflix. This is the first new anime that I've gotten into in a long time and it spurred a domino effect of binge watching. Basic premise: video games have become a fully immersive experience with the release of Sword Art Online; however, thousands of players discover that once they've logged on they can't log out and the only way to get back to the real world is the transcend the games 100 levels without dying. Any in game deaths result in the real-world death of the player. Pretty intense. I really enjoyed this anime. Great animation, great premise. Only one season is currently out, but the second season is due to air next month. I would give the first season four and a half out of five stars overall: five out of five stars for the fist half and four out of five for the second. Definitely worth checking out. After Sword Art Online, I jumped straight into Fate/Zero, also on Netflix. Basic premise: in order to obtain the Wholly Grail, mages resurrect heroes from ancient history to fight on their behalf. Really really good. I'm not going to go into much more detail because it's more fun to go in not knowing much. Five out of five stars. And finally, I just started watching Knights of Sidonia. I'm not far enough in to have any solid opinions, but the basic premise involves gigantic space monsters called Gauna who threaten the last of humanity, now residing in a space settlement known as Sidonia. So far, I'd say its about as brutal as Attack on Titan. I'll let you know more once I've finished watching. 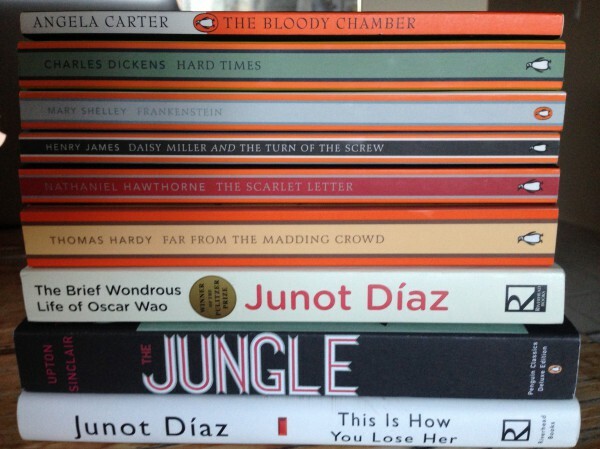 Compared with the flurry of reading that was April, May was a relatively slow reading month. I was settling into my summer job and decided to tackle Murakami's behemoth 1Q84, which slowed my reading productivity considerably. Regardless, I really really enjoyed everything I read in May. I kicked the month off with Jeffrey Eugenides' The Virgin Suicides, which was absolutely phenomenal. I loved the POV, the precise and evocative writing, and the intensely appealing, immersive atmosphere of this novel. It left me with a very acute book hangover and I decided to watch the 1999 movie adaptation as soon as I finished reading. I intend to post a full book and movie review in the very near future. I was still submerged in my book hangover when I jumped into George Orwell's 1984, which is so starkly different from The Virgin Suicides in tone, atmosphere, and style. Regardless, I found it easy to immerse myself in the disturbing world of Oceania, particularly in the first third to half of the novel. For me, 1984's greatest strength was in it's world building and political commentary. I sincerely enjoyed the novel when it focused on these aspects; however, I was much less interested when the novel's focus shifted to Winston's romance. I found the romance hard to believe due to the lack of character development and couldn't help but be troubled by Orwell's depiction of female characters. A full review will be forthcoming. Finally, I read the first two novels in Haruki Murakami's 1Q84. I am a huge fan of Murakami's writing and thus had (and continue to have) high expectations for his most recent novel. So far, I can't say that I am in any way disappointed with 1Q84, as different as it is from Murakami's other works. However, I am noticing that I personally enjoy his shorter novels better than his longer ones. I am still making my way through the final book of 1Q84 and will update with more fully developed opinions at that point. May/June wrap up and some discussion and review posts will be coming soon! Been doing a lot of reading, but haven't been able to form coherent thoughts on these readings until now. New posts should be up in the next week or so. Thinking of doing an anime update as well. Let me know what you think. I'm late with this, but here's my April wrap up. This month I read seven books! First I completed Garbriel Garcia Marquez's Love in the Time of Cholera, which I really enjoyed. Marquez's prose is absolutely gorgeous and I loved the atmosphere that he imbued this novel with. After that I read Vonnegut's Slaughterhouse-Five, which was unlike anything I have read thus far. Really interesting and easy to engage with. I really enjoyed the use of short, snapshot scenes and time travel. The third book I read was Things Fall Apart by Chinua Achebe. I absolutely loved experiencing a small chunk of African culture through this novel and intend to continue reading the remainer of Achebe's African Trilogy and looking in to his other works. I was really surprised by how much I enjoyed my fourth book this month: Siddhartha by Hermann Hess. I anticipated struggling to get through this work, but I found it very easy to read and engaging as a piece of philosophy. Though I appreciated the narrative elements of this novel, I read it primarily as a work of philosophy. The fifth book I read this month was Sylvia Plath's The Bell Jar. Though I enjoyed the prose of this piece and appreciated the focus on depression, I couldn't help but feel a barrier between myself and the main characters of the novel, who is also the narrator and was, therefore, inseparable from my experience of the narrative. I wasn't intending to read James M. Cain's The Postman Always Rings Twice, but I found myself away from home and without internet for a few days and needed something to read after I finished The Bell Jar. I absolutely loved this novel. So concise, concrete, and visceral. An absolute pleasure to read. I actually completed Cormac McCarthy's No Country for Old Men, the last book on my April TBR early in May, but I decided to include it here. I really did love elements of the writing in this novel, but overall I found it hard to engage with. For a high action novel, it felt anticlimactic and stilted. Overall, I'd say that I had a very successful reading month this April. 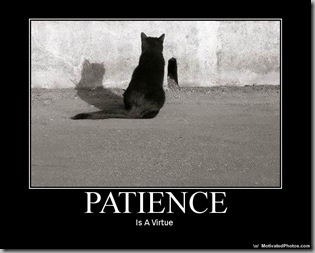 I hope to be equally successful this month. Escape From Camp 14 Review! I read Escape From Camp 14 by Blaine Harden right at the end of February and I could not put it down. I read it in one day and was completely immersed in the terrifying world of North Korea's concentration camps. 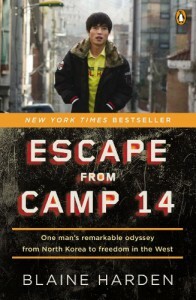 Escape From Camp 14 is a nonfiction book that recounts Shin Dong Hyuk's life in and escape from one of North Korea's most brutal concentration camps, Camp 14. I really appreciated how well Blaine Harden balanced the "high action" events in Shin's life with engaging and easy to read background on North Korea's concentration camps and relationship with surrounding countries, namely South Korea and China. Though I took the information that I received through this text with a grain of salt, as I have not been able to do any further research and it is extremely difficult to get any definitive facts about what is happening in North Korea, I felt like this was a really great place to start gaining some information about the extreme conditions in North Korea. It should be difficult to believe that there are still concentration camps in the world, but unfortunately, I didn't find it hard to believe at all. For that reason, I think it is almost more important to spread awareness about these camps. Even with my limited knowledge about North Korea, I was not surprised to learn that many people inside and outside of Korea either do not know about these camp or turn a blind eye to them. This is a highly political book and one that brings up ethical issues, humanitarian issues, and personal issues as they are exemplified by the treatment of the prisoners and escapees of these camps. I would recommend this book to anyone interested in fast-paced, engaging, and thought-provoking nonfiction narratives. It is definitely worth reading. I've been sitting on this review for a couple weeks and I'm still not sure how to do it. 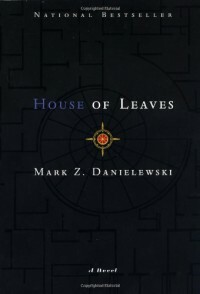 Mark Z. Danielewski's House of Leaves in a seminal piece of experimental literature, and is probably the best known book of its kind. House of Leaves experiments not only with authorship and story structure, but also with the verisimilitude of text and visual images (and so much more). The novel is jam-packed with references to literature, history, photography, academia and, to some extent, parodies the way that we impose meaning onto written text and photographs. It is extremely hard to summarizes all that is brought together in this text, and it truly is a gold mine for thesis topics for English lit students. However, I think it has immense value outside of an academic setting. It's a difficult book, but an extremely rewarding one as well. they adjust to living in a new house in the country; however, this house operates in a unique and terrifying way. I would recommend this book to anyone willing to undergo a challenge. The House of Leaves has a super interesting premise and the way that the novel is formatted makes the reading experience unique, engaging, and an experience onto itself. 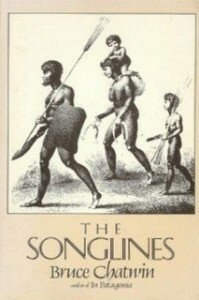 I had to read Bruce Chatwin's The Songlines last month for my travel writing course. This is my first experience with Chatwin's writing and with this form of travel literature. I wasn't sure what to expect going into it, so I opted for not expecting anything, which turned out well in the end. Since I didn't go into this novel with a set idea about what it was doing, I found that I was able enjoy the simple aspects of reading it, like how much it made me want to travel to Australia and learn more about the creation myths of the aboriginals there. The Songlines had a really interesting focus, which kept me engaged even though it was pretty dead plot-wise. I'm not sure how much of it is based on fact and how much of it is fictionalized, but I found the aboriginal creation stories surrounding the Songlines really interesting, though I cannot for the life of me give a simple description of what the Songlines are. I also really loved the focus on nomadic tribes in general, and the correlation between movement and happiness in these cultures. Reading this book, felt like a really unique springboard that made me consider and want to learn more about things that I hadn't thought of before. The value that I gained from this book comes primarily from the information and inspiration to learn that it imbued in me, and not so much from its status as a piece of literature. Though, the writing was well crafted and at times even beautiful, I couldn't fully identify my experience with this book as a literary one. I feel like I would have had a very similar experience if this were a documentary that I watched. The value truly was in the information and intellectual discussion surrounding nomadism. I would recommend this book to anyone who is interested in creation myths and travelling to Australia. I really think that it's a great starting point if you are interested in aboriginal mythologies or nomadic mythologies and don't know where to start.